Gray wolves haven't been a fixture in California since they were driven to virtual extinction in the U.S. early last century, but that isn't stopping state wildlife officials from taking a historic step to ensure that, when they do decide to return, they'll find things much more hospitable. Yesterday, the California Fish and Game Commission voted to list gray wolves under the state's Endangered Species Act, despite the urging of ranchers and hunting groups who consider the predator a potential menace that might attack livestock and claim game animals for themselves. 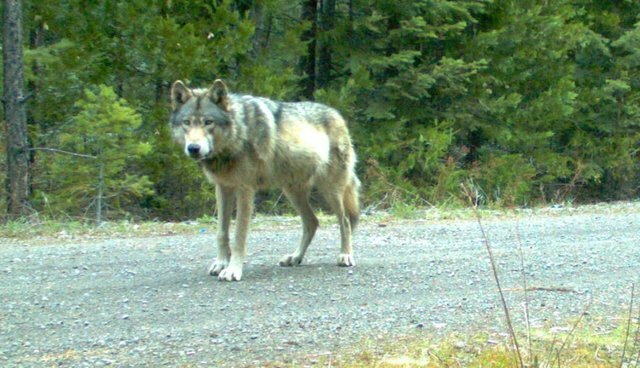 The move was prompted by the discovery of two wolf cubs on a forest camera just across the border in southwestern Oregon. The pups are believed to be the offspring of a collared gray wolf, dubbed OR7, who made headlines in recent years for becoming the first of its kind in California in nearly nine decades, though each of his forays into the state has thus far been brief. Officials believe that as OR7 establishes a pack, it may only be a matter of time before gray wolves once again become permanent residents in California. Since the wolves first began to be reintroduced in parts of the U.S. in the 1990s listed under the Federal Endangered Species Act, they have gained a foothold in several states that were part of their historical range -- though not without controversy. The wolves' resurgence in places like Montana, Idaho and Wyoming have led to calls for the species to be delisted nationwide, allowing for them to be hunted as a problem predator. "While other states bicker and quarrel, California adds the latest chapter to one of the world's greatest biological success stories."